The C8-generation Audi A6 Avant has an allroad version coming, and it appears to be close to a debut judging by the minimal camouflage on the development car spotted here. This will be similar to the Avant on which it is based, visually differentiated by the plastic cladding around its wheel arches – of which a sliver here is visible ahead of the front wheel – with more rugged looking lower bumper edges. Save for a taller and driver-adjustable ride height as with the previous allroad, its exterior is much the same as that of the standard A6 Avant. Inside, the cabin should remain similar as well, albeit with the application of allroad-specific upholstery. Powertrain configurations should be in line with that of the Avant, which in turn is derived from the sedan. Thus, it should comprise a petrol and a diesel, both 3.0 litre V6 units, mated to quattro all-wheel-drive. In the Avant, the petrol is a 335 hp/500 Nm unit paired with a seven-speed dual-clutch automatic, while the diesel makes 282 hp and 620 Nm of torque, sent to an eight-speed torque converter auto. Likewise, the 48V electrical architecture should also feature here, which employs a belt alternator starter (BAS) works together with a lithium-ion battery to allow for coasting at speeds between 55 and 160 km/h. The full suite of active safety systems can similarly be expected to feature in this upcoming A6 allroad. In the A6 Avant, this packs up to five radar sensors, five cameras, 12 ultrasonic sensors and a laser scanner. The post SPYSHOTS: Audi A6 allroad in production clothes appeared first on Paul Tan's Automotive News. 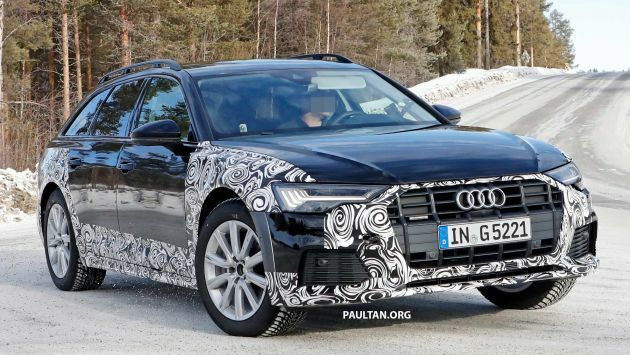 0 Response to "SPYSHOTS: Audi A6 allroad in production clothes"